All our Trail Ride activities have a 48 hour cancellation policy. Cancellations outside of 48 hours receive a full refund. Cancellations inside of 48 hours prior to tour departure are 100% non refundable. Please note that this policy is non-negotiable. All our backcountry trips have a 30 day cancellation policy. Cancellations outside of 30 days receive a full refund. Cancellations inside of 30 days prior to tour departure are 100% non refundable. Please note that this policy is non-negotiable. We accept Visa and MasterCard. You may include your credit card number on the application form for immediate confirmation. All Credit Card and personal information are submitted through a secured site and is only accessible by our office. All bookings are subject to a 5% Goods & Services Tax. Parks Canada has instituted a fee per person per night for guests of Banff National Park staying in the backcountry. Your contribution will help cover the costs of trail maintenance and repair, warden services, wildlife monitoring, and public information and safety. This fee is included in the cost of your trip and we remit it to Parks Canada on your behalf. We strongly recommend that all guests purchase travel, health, and cancellation insurance directly after booking a trip. 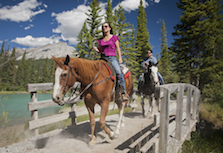 Please note that each rider will be required to sign a waiver releasing Banff Trail Riders and Her Majesty in Right of Canada as represented by Parks Canada Agency from all risks. Safety experts recommend hard hats and narrow boots. Helmets are provided on our tours and are mandatory. Please review our waiver that you will be required to sign prior to your tour. A waiver must be completed by the parent or legal guardian of any person under the age of 18 (documentation may be required to confirm the signatory’s authority). With a herd numbering over 300 horses, we can accommodate just about anyone but please note that some restrictions on age and weight may apply. Please note that our maximum weight limit is 250lbs. A 7 day cancellation policy applies to winter lodge bookings. Please note that this policy is non-negotiable.